To attend One Lone Pear Tree, you must pass through a sub-sidewalk downstairs door. There is a sense you are en route to a speakeasy, and you’ll be drinking beer in bags, and cocktails in teacups. You won’t, but you’ll feel a tinge of rebellion. You’ll tend to chuckle. Despite the expansive backyard setting, it still feels like you’re part of a secret club. There was even homemade pie! 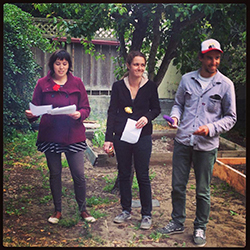 Nestled between a bonfire, and the Lone Pear Tree, the audience last week laughed and sighed to the four poets chosen to read: Alex Gilliam, Sarah Carpenter, Sarah Kobrinsky, and David Morini. Leonard Crosby began this series last year, and cohosted with Crys Lehman (who has since moved to Iowa). Now he’s running it solo, and doing an excellent job. He hopes to keep it a monthly summer occurrence. June 5th marked it’s kick-off for 2014. 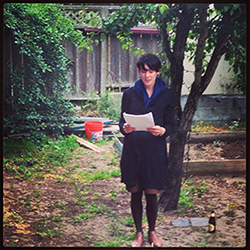 As the bonfire smoldered, Alex Gilliam opened the night with her set of short, pithy poems. She is garnering her MFA from California College of Arts. Sarah Carpenter followed with new work, and added a dynamic flavor to the event. Her whimsy carried well in lines like “I found my favorite spot in Golden Gate Park. I know what you’re thinking. It’s the waterslide, right? Well, no. But close. It’s next to the waterslide.” Moneta Goldsmith and Ginger Buswell both read sections of her work, helping to lift the poem off the page. 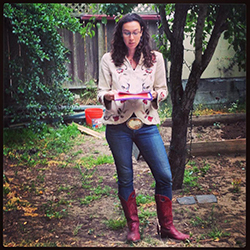 Sarah Kobrinksy, Poet Laureate of Emeryville, took the stage in a belt-buckle emblazoned with her title. She had the audience in stitches with her wordplay and insight. In Pöem, she writes, “For fun, my brother and his wife visit IKEA to watch couples argue and fall apart over the price of furniture that will also fall apart.” You can’t help but double take. Her panache kept the audience rapt, and curious to hear more. With the tone set to play, David Morini continued the trend and led the audience into roils of laughter. 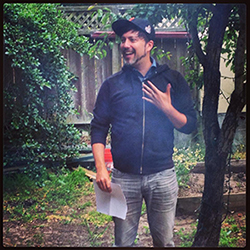 He offered a long-form persona poem in the voice of a coach for a gay softball team. Everyone in the bonfire circle felt sure s/he was getting direct and absurd instructions on how to play, how to play ball, and maybe even how to ballroom dance. After the series, people canvassed the garden stones, milling between the vegetable boxes, bonfire, and beer cooler. But when we went back for pie, the dish was empty. This is a reading not to miss! Check out the One Lone Pear Tree facebook for upcoming dates. It usually gets going around 7. 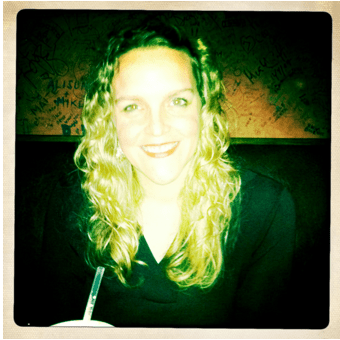 Xan L. Roberti is the winner of the 2014 New South Poetry Contest, and runner up in the Mississipi Valley Poetry Contest 2013. Her memoir Portable Housing was nominated for the Walter Sindlinger Award at Columbia University Teachers College. She received her MFA in Poetry from Sarah Lawrence College, where she was the graduate keynote speaker. She lives in San Francisco on a windy hill.